We have Arizona collector spoons in Pewter, Copper, and Silver. If you want to make your friends from around the country crack up, we also have humor items like Arizona Ice Scrapers and Rattlesnake Eggs. Click Here! 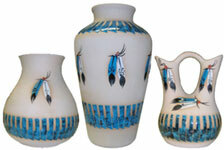 We have one of a kind Indian Art and Decor Items that are sure to make a unique statement. Arizona Specialty Books, Cowboy Poetry, Cowboy Cookbooks, you name it! eBooks are also available. Our popular Polar Fleece Blankets are now online, and the Woven Blankets and Rugs are coming soon! Take home a little bit of Arizona! Whether you're looking for live cacti, cactus seeds, or other desert plant seeds, we're your stop for all things cactus. Much more than just tools for marking time, our calendars bring home that wonderful Western spirit that keeps you going from morning 'till night. Stop on over! We have Cowboy-themed Decorative Candles for sale online. Whether you're looking for old-fashioned hard candies or specialty candies manufactured from the Prickly Pear Cactus fruit, we have confections that are sure to delight. We have Western-themed cards for every occasion as well as our popular boxed card sets. Make it a Cowboy Christmas at The Old Livery! Whether it's ornaments, music, or maybe some Christmas Boots, we're ready to help boost your spirits at that most special time of year. Make passing the time more enjoyable with our diverse lineup of clocks. Whether you're after our unique horse clocks with wagging tails, a decorative hardwood clock, or a simple wall clock, we have what you want. Always popular, we offer T-Shirts and Denim Shirts for our guests. 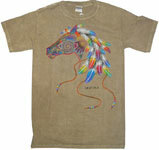 Many contain Arizona, Old West, and Native American themes. We sell coasters for the discerning consumer, the pro on the go, and for folks who just want something to sit their drink on. We offer decorative ceramic tiles for the wall, the floor, or for address signs. One of our current suppliers of Mugs has just announced that they are entering the market, too, so look for updates! Always popular sellers, we offer dolls depicting Native Americans or Cowboys. 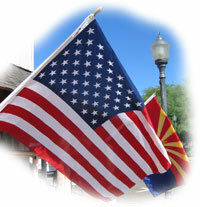 We have 100% American-Made Flags that are sure to dress up your frontage. Besides Old Glory, we also offer many flags of the Western States. Your one stop shop for Mining Memorabilia, Railroad Heritage, minerals, geodes, or to do some mining of your own in the famous Wickenburg Mining Cart. We are more than happy to fill out a Gift Certificate for you and mail it to the intended recipient. Choose from our quality selection of headwear! We offer a wide variety of Honey Products, Jellies, and Spreads that are produced from fruits and vegetables grown right here in Arizona. Brought to you by popular demand, we have consolidated all of our Equestrian items into one easy to find place. These items are sure to add to your experiences as an owner or rider. We love horses as much as you do! These are unique, hand-carved sculptures and boxes that showcase the diverse traditions of the Southwestern artisan. There are no other wood carvings like these. We are proud to offer authentic Native American Jewelry, all of which has been handcrafted by either Zuni or Navajo craftsmen. Celebrate the life of our favorite movie star and all around Great American. John Wayne was a leader in bringing filmmaking to Arizona, and he owned ranches in Arizona as well. A popular, compact, and affordable souvenir, we offer plenty of Key Chains to suit your fancy. We've got just what you need for your lil' buckaroo. 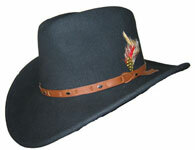 We offer Cowboy outfits, Cowgirl outfits, Western-themed toys, Stuffed Animals, and much more. Whether you are looking for Aprons, Napkins, Oven Mitts, Placemats, or Potholders, you're bound to find the perfect item to make things a little Western around the ol' Chuck Wagon. We've even got cookie cutters and shaker sets! As long as you play by the rules, we're more than happy to sell knives of all shapes and sizes to our guests. We are authorized dealers for Steep Mountain Knives and Victorinox Swiss Army Knives. 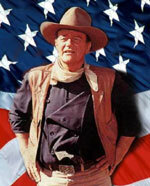 We also offer hunting knives and the ever-popular John Wayne Commemorative series of folding knives. We have wallets, purses, cell phone holders, and much more. As always, we're ready to give you that wonderful Old West look and feel. Personalize your vehicle with a decorative license plate carrying an Arizona or Route 66 theme. We offer western-themed mugs to add to your enjoyment of that fine morning brew. We maintain a selection of authentic Western Music, including the traditional Cowboy Songs many learned from Roy Rogers and Gene Autry. In addition to Roy and Gene, we are proud to feature performances by the Sons of the San Joaquin, Red Steagall, Don Edwards, Bob Wills, and more. Let us take you on a journey back to the Old West! We have an eclectic mix of authentic Native American artifacts for you to browse through, including Navajo Tomahawks, Peace Pipes, and Arrows. We know most of the Artists personally, too, so you can be assured that the pieces we sell are authentic and representative of the lifestyle of the First Americans. We offer a unique collection of Photo Albums that will add a Southwestern flair to your photo archives. Make your trip to the Southwest a bit more memorable! Bring the Old West home with framed pictures of your favorite Silver Screen Cowboys, framed prints of beautiful Western Art, or accentuate your own art with one of our frames. We offer pillows of all shapes and sizes. 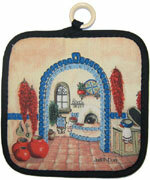 We offer a broad selection of high quality placemats, potholders, and linens. Many of these items are made right here in America, too. Our selection of pottery is bound to include something you've been looking for. In addition to our mainstay pottery items, we also feature unique pottery by local artisans. We offer puzzles that emerge as beautiful examples of Western Art. Many contain hidden images that will delight young and old alike for hours. Celebrate Main Street of America, the best way to tour the West. Leading from Chicago to L.A. and hitting nearly every major piece of the Old West in between, there is no road like it in the world. Whether you're looking for a mild barbecue sauce or hot sauce so powerful you should only add it in drops, we have what you're after. We've also got a nice assortment of prepackaged food that's all spiced up and ready to set your mouth on fire if you want. We offer Copper, Resin, and Ceramic Sculptures that depict life in the West. A popular souvenir item, we offer ceramic and glass shot glasses featuring Western and Arizona themes. We even have a few double shot glasses. We offer everything from hand creams for the ladies to soap designed to remove even the toughest material that a real working Cowboy might encounter. From Ceramic and Wood Wall Plaques to Steel Wall Hangings, Coat Racks, Keychain Hooks, Barnwood Signs, Shadow Boxes, or even Mailbox Flags, we have the Western Decor you're looking for! Don't see what you're looking for? Did you see something in our brick and mortar store and want to buy it now? Just give us a call or send us an e-mail. We are more than happy to accommodate you and can offer secure payment options directly to you via email. We Ship UPS, FedEx, and United States Postal Service. Our Online Store Accepts Visa, MasterCard, Discover, American Express, and Paypal as valid forms of payment. The Brick-and-Mortar Store is only equipped to process Visa and Master Card, but will accept a personal check upon presentation of a valid Driver's License.